fastboatman29212 wrote: Pics won't tell me much because I won't be able to see how the linkages work. Sounds like you are right. Probably the secondary is not working. The carb should still work OK without the dashpot. I really don't know if the secondary is vacuum or not. Sorry. Guys, great photos and very helpful. I'm experiencing fuel leak around accelerator boot on my 83 Nissan 720 Z24 Carb thought I might run this question up the flag pole and test the water. I know I'll probably have to order a complete kit to get the parts but my question is can I replace the associated components without doing a complete removal or should I do the right thing and do a complete rebuild. Truck in one owner with 350k+ miles and only engine repair - head gasket. I think I know the answer but wanted second opinion. Thanks and by the way great forum! I'd try just doing the accelerator pump. 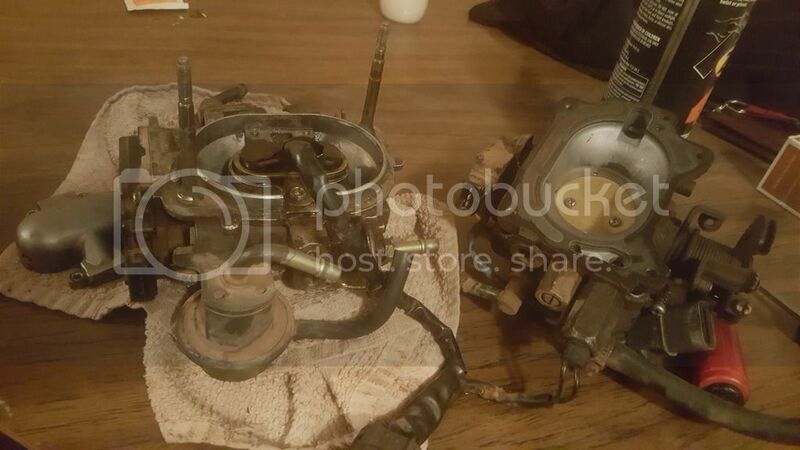 I rebuilt my carb and didn't notice a big difference in performance. It did give me peace of mind. I have an 85 kc 2wd, when shifting gears, the rpms stays at 2000 with the clutch in and slowly goes down. I feels like it's sticks. Any ideas? Well, could be a sticky throttle cable, vacuum leak, carb linkage is sticky. If it does that in the driveway, then I'd start with the throttle cable, then check for a vacuum leak. thank you . Also on the freeway going about 65 mph, I push the clutch in and it revs to about 3000 and slowly goes back down. It was the cable. Time to replace it. For now I sprayed it with lithium white grease and runs great. Thank you bro. hey fastboatman, first off, excellent tutorial! I, like others registered just to comment. I ended up learning a ton of valuable info. My question is this. Background, I have two 720 4x4s my donor is low miles-ish (158000 ). My driver has high miles 300. I runs strong is stock (drivetrain). I want to switch out my hitachi for the weber on my donor. Also, the donor is beat to death and body rotting. I have plenty of experience swapping engines. Time is my issue. what is your opinion? And, off topic, soon as I can I will be letting parts go. If people have needs, well, a closed mouth don't get fed! Speak up and I'll see what I can do to help. P.S. great forum all around! glad I joined!!! Thank You, J.
I've never done the Weber carb swap. People who did that swap like it. Just make sure all the vacuum lines get plugged. A vacuum leak will kill the performance. If U can do an engine swap on a 4X4 then you need to post a DIY if you have time because it would help others. Hi my 86 z24 is flooding so bad that it won't start.. I'm getting spark and fuel and when I went to pull a plug to check compression there was a ton of fuel. What could be causing this the float being stuck?? Yes, the float is probably stuck. At least that's the first thing to check. How would I tear it down to the float? Or is there a way to check it without taking it apart. I just get thrown off by your pics because mine looks different.. I'm the one who posted about the truck not even running on ether. It's driving me nuts cause we messed with it some when I bought it and drove it onto the trailer!! Check out the DIY section. I made a carb rebuild DIY post. Study that post and you will see how to open and inspect the fuel bowl. Here is the link. Looks like your carb isn't typical for a 1984-86 720. Next step is find the place where the fuel line goes into the carb. That should be the fuel bowl. Make sense? Fuel gets pumped into the bowl and then the float rises. When the float gets high enough it pushes the float needle up to close the bowl inlet so no more fuel enters the bowl. Fuel then is diverted via other passages to the fuel return line where it goes back to the tank. Older vehicles like my 1965 Chevy truck have a lower pressure fuel pump and the carb float needle just closes. Put a new carb on it same results... Really gettin frustrated with this project!! I'm sure you checked the intake side for spark, but that has to be the problem. You have fuel. You have compression because it did run once at least. Either something is shorting out your spark or your coil is bad or intermittent. You can swap the intake and exhaust coils just to check. Not sure what else to say. 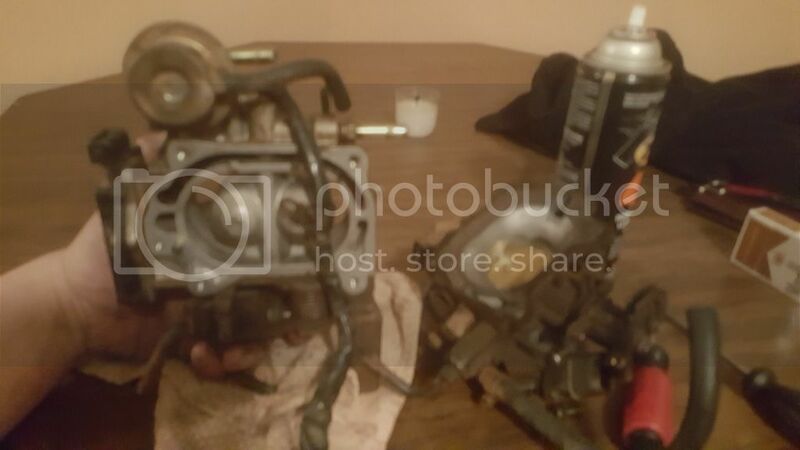 That looks like the 1986 throttle body injection, it's not really a carb, I don't even know if it has a float. Put spark plug and coil wires back the way it was when you first had it running. Pull a plug wire off if an intake spark plug but leave the plug in the head. Use an extra spark plug (or just buy an extra one) and hook it to the spare spark plug. Crank the engine while holding the plug next to a ground (engine block, frame, etc). You should see it spark while cranking the engine. If not, then the coil isn't sending a spark. so I now found another broken piece on my carb..... choke control diaphragm? Driver side,short vacuum line going to top of carb? The arm on the diaphragm is broken. First problem is broken vent...someone had messed this thing up. I'm thinking may just need to get a carb. I'm in Cali so guess a weber is out. Anyone have any experience with any of the cheaper carbs out there? Probably not a good thing to cheap out on but if anyone has experience with them I'd like to hear about it. My truck isn't running well. I seem to have low compression in at least one cylinder. My rebuilt carb may be up for sale. However, it's not a Cali carb. These carbs often get tossed and new purchased when parts break. Too bad about your broken carb. Do you know where the ID tags at? How much you want for your carb fastboatman? Nothing is for sale just yet. Sorry. I have to test compression first. If my compression is good then I might not sell anything. If the engine is shot then I will part out the engine, carb and sell the tires and wheels and then let someone make a rat rod out of it. Body and bed are in good shape. I'll let you know in about a week. I can't see that this question was ever addressed anywhere, however this exact thing happened to me today. Got my new rear window installed and was driving the truck up the driveway from my shop and it sputtered a couple times then died. Would not re-start. Tried to fire once or twice but died immediately. When I popped the hood to check a few things there was a very loud ticking/clicking in the area of the carb. Towed the truck back down to the shop but it fired up and ran and the ticking in gone at the carb. It's been fine since so I haven't been able to diagnose. Could that potentially have been caused by the anti-dieseling solenoid? Does it have any control over the fuel pump? The air cutoffs on these are vacuum operated right? Pretty stumped but it has me worried to set out down the road in this thing now.